Versatile little lifesaver makes a big noise for such a small item. 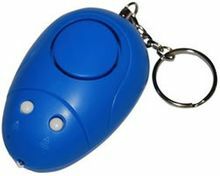 The Blue Mouse Alarm can sound the siren by either pressing the button or pulling out the pin (where the keyring is attached). Also has a small flashlight to help you find things in your purse. The activation pin design allows you to attach one end to your purse or laptop (with a string you provide) and you hold on to the the alarm. If someone takes the purse from you, the alarm will sound. If you order more than 6 of these and want expedited shipping, please email us for actual shipping charges. Note, some hospitals find these very useful.